Just by the skin of our teeth, we’re entering TravelSupermarket’s Capture the Colour travel photography contest! We were graciously nominated by our friends Vicky & Dave of A Couple Travelers and we couldn’t let their nomination be in vain. I snapped this picture at the Rochester County Fair when we were up visiting my family in Minnesota right before we left on our big trip. 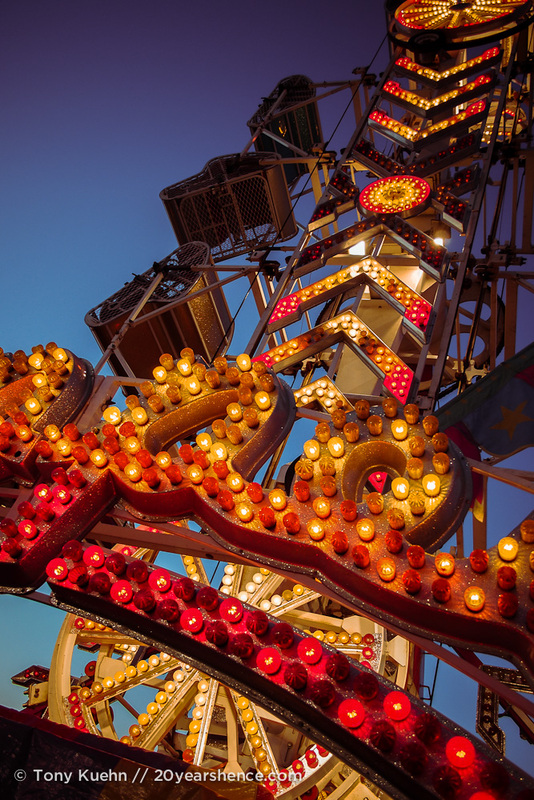 The ride is called The Zipper and takes center stage on the rather quaint midway. While I’m happy to take a picture of it, I would never ride it! 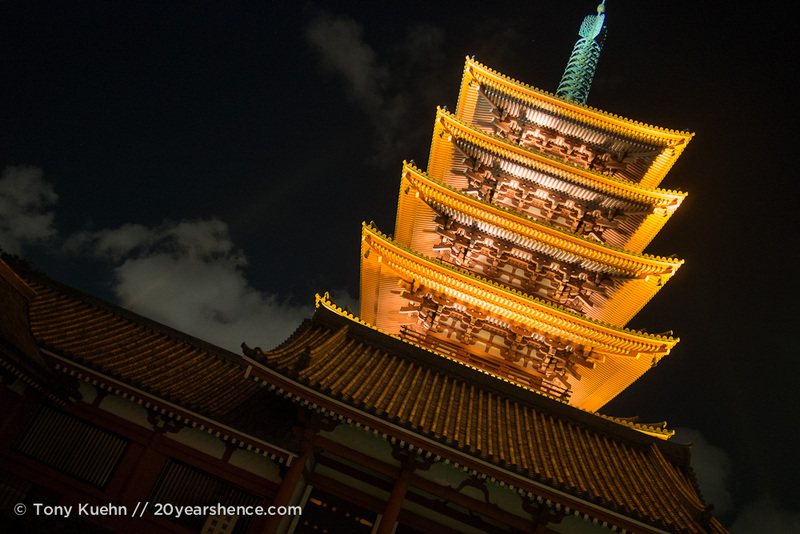 The five-storied pagoda at Senso-Ji temple in Asakusa, Tokyo is always rather stunning, but at night it is lit from below. This causes the eaves of each story, which look like simple yellow during the day, to burst into luminescent gold. 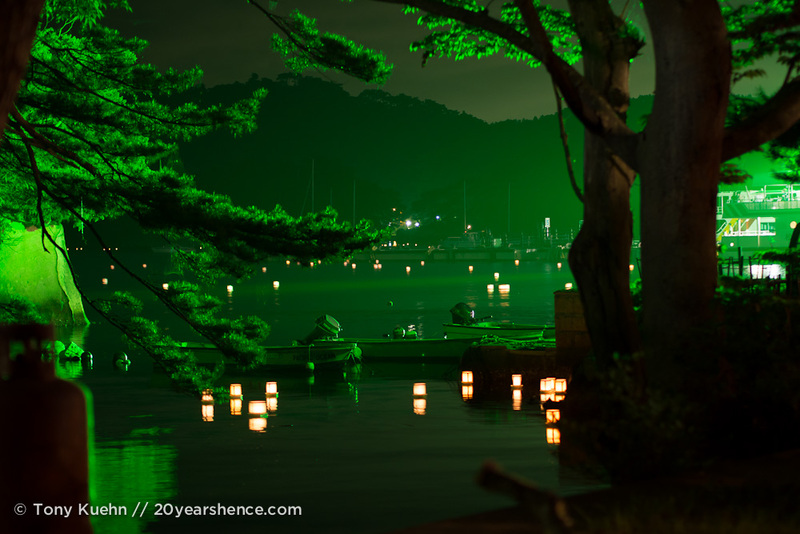 Every year at the Obon festival in Matsushima, celebrants release thousands of paper lanterns inscribed with the names of their ancestors into the harbor. This ritual, toro nagashi, is followed by one of Japan’s best firework displays. This photo was taken moments before the fireworks began, when the harbor was lit by giant green floodlights of passenger ferries and the last few lanterns were floating into this secluded alcove. 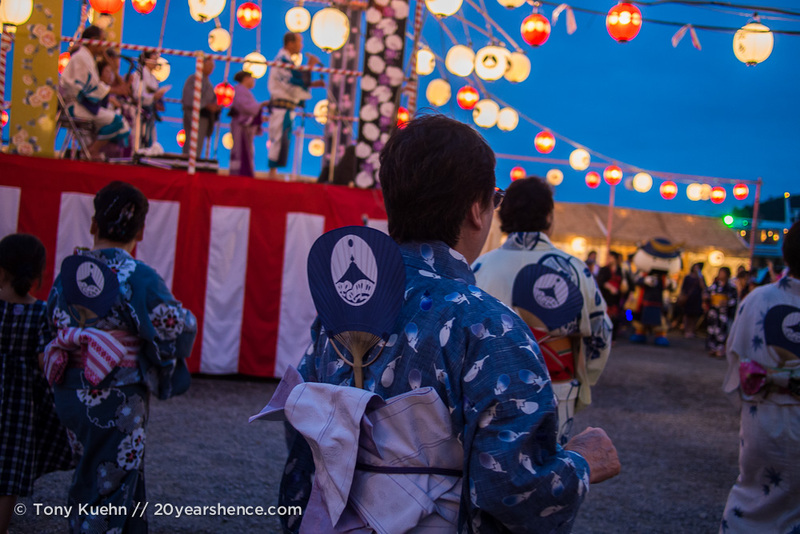 Another part of the Obon festival involves traditional dances, known as Bon-Odori. As the sun sank behind the sea, I was struck by the blue of the sky against the blue of the dancer’s outfits and the blue of their fans (emblazoned with Matsushima’s logo) as they made their way around the bandstand in step with the music. 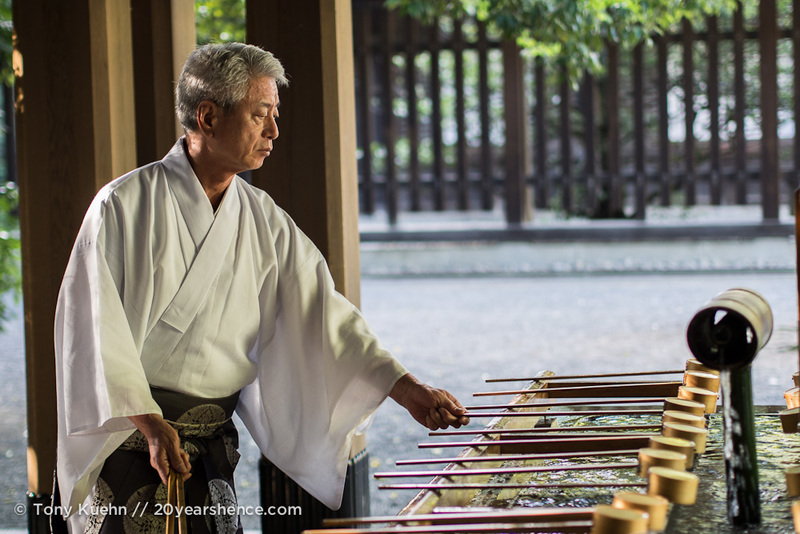 This picture was taken at the purification font just outside of Meiji-Jingu Temple in Tokyo. Towards the end of the day, this temple attendant came over to the basin to set all the ladles in order, in preparation for the next wave of faithful. The light was so perfect and the scene was so quiet but profound, I could not help but capture it! Also, look how crisp and perfect his robe is despite the oppressive heat and humidity! Thanks! I’m partial to them all, obviously, but those two were especially serendipitous! Great photos! Especially love the yellow and green ones! So excited to get to Japan in a little over two weeks! Currently trying to figure out exactly where we’ll be each day to start reaching out to couchsurfers! Hoping to pick up a JR pass this week! Maybe you will have better luck with CS than we had, but we found it REALLY hard to find people to surf with in Japan. We found two people who were willing to host us and had a blast with them, but by and large, from what I have read, Japan is a hard place to surf. We contacted about 7 people in Kyoto well over a month before we would get there and everyone was already full! Also, several people that we contacted in various cities just never got back to us, and one person told us we could surf with him and then actually never gave us any info to get in contact with him and we wound up having to get a hotel room! Could be because we were traveling during high season (August is surely more busy than September for travel), but I have also read that because many Japanese homes are so small, may CouchSurfers are unable to take more than one person, and in general, the Japanese CouchSurfing community is much smaller than you would think. Anyway, don’t want to dissuade you because we did have some luck and had so much fun with the hosts we did find, but we struck out far more than we had home runs! Good luck! Thanks Steph good to know! We are just now starting to contact couchsurfers so we may be a bit late already I guess! Any chance you would be willing to share the profiles of the couchsurfers who hosted you? If we contact them we would love to drop your name! Also an unrelated question — how did you feel about the amount of time you had in Tokyo vs Kyoto? Right now I’m planning on spending 3 full days in each (with an extra half day in Kyoto). re: Couchsurfing: I will send you an email with the people we stayed with! We are so far behind in terms of keeping the blog current (blogwise, we’re still on our third day of travel!) that although we will definitely write about our CouchSurfing experience here, it will probably be a bit longer before we get that info up! Also, if you want to send me your itinerary for Japan to peruse I can absolutely do that. I forget how long you are spending here, but we definitely have thoughts about how to best spend time! Now, it could be because we were just starting out and were finding our travel legs, but while we think that for our trip it made sense to spend 3 days in Tokyo while we got our bearings and got over jetlag, it was definitely our least favorite place thus far. It really doesn’t feel like the rest of Japan, and while it is easy to travel around and there is a lot of English, we were so much happier once we got out of there and starteed seeing other places. We have both said (and will say so in a post at some point!) that there are many places we have since visited that we would happily revisit one day, but we have no desire to ever go back to Tokyo (and we spoke to a few people at our hostel in Tokyo (Sakura Asakusa, if you’re interested… it was reasonable for Tokyo and really pretty good!) who felt the same way). Maybe we focused on the wrong stuff or were just in a bit of a funk, but I think 3 days is more than enough in Tokyo, but not nearly enough for Kyoto! We are spending a week here and that feels rushed. I know you guys like to travel fast, but in reality, there is SO MUCH MORE to see and do around Kyoto than Tokyo, if you are interested more in the cultural and historical aspects of Japan, so I personally think Kyoto needs at least 5 days! Thanks so much! We appreciate even our quiet readers 🙂 I am getting the feeling that the green photo is a real winner, and I’m glad everyone is liking it so much! I feel gutted at not having visited Senso ji at night. Your captures are just fabulous, all of them. Thank you! I don’t know that we would have thought to go there at night either had we not been staying there and walking through was required to get to our hostel. I can say that it is a very different place at night, weirdly quiet, even for Tokyo. Thanks! It’s one of my favorites too, if nothing else for the whole situation surrounding it. It was a very magical night!